Very durable rug for a high traffic area. Love the natural look and the price was on-point for such a great purchase! Very nice rug - put togeather nicely, tight sisal weave, very few and unnoticable imperfactions in the sisal. Dark chocalte boarder matches our living room well but does make any dust, etc... very apparent. Not a bad thing - just makes us vacuum more. When it came in the mail (it came within 3 days - fantastic! )it took about a week with soup cans on the edges to make it lay straight but it has not curled up on the edges since. Very happy with the purchase. 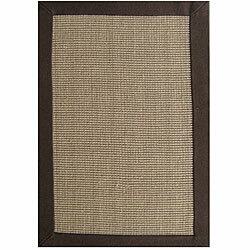 this sisal choco brown jute area rug is strong but the color was not on target. I ordered this rug and received it the next day! The color in the center of the rug is a little lighter than the picture shows, but that was a nice surprise for me...I was hoping it would be :) The rug does have an odor, but it quickly fades. This rug was a wonderful buy compared to rugs I had seen for around $100 dollars more. Thanks overstock.com!!! This rug was an excellent choice for a dining area in a condo. It was a nice way to divide the room using floor covering. The rug is well made and the colors are true to the picture. The fabric edging gives the rug a nice finished look. Used it under contemporary/casual dining table and leather chairs. Purchased this rug for my daughter who has a studio apartment. If you are looking for something that you can easily whisk off with a broom or dust buster this will work. It has a tight weave that looks like you could easily spot clean. I liked the non skid backing as we did not have to purchase any additional underlayment. The materials were surprisingly soft underfoot as opposed to be 'scratchy' like some sisal weaves can be. We plan to use this rug for the few years that she is still in school and it met all of our needs. Overall, we were both pleased with this purchase! This rug is just what I was looking for. This rug is a great value it is durable and well made. Color is just as pictured. Rolled out with ease and lays flat. I love the dark brown border. Everyone wanted to know where I bought it. Received the rug and it's perfect! 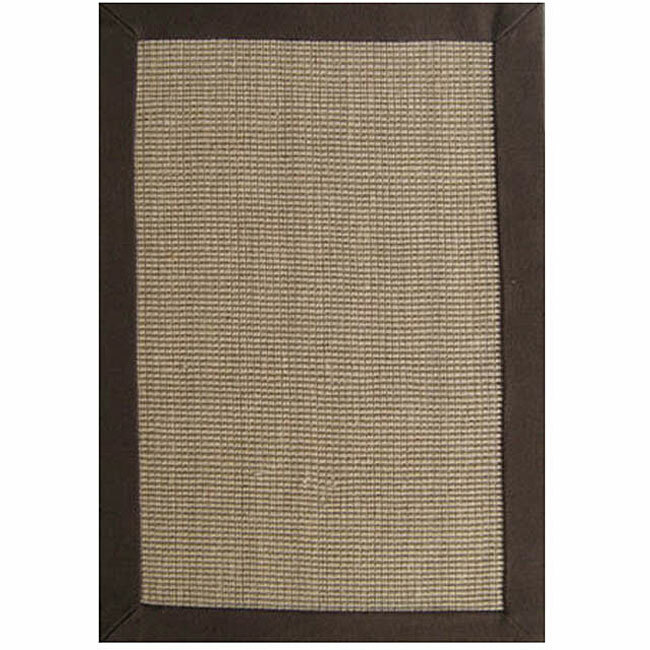 Great quality and has a very nice backing so it doesn't require a rug pad. I would highly recommend this rug! This rug was exactly what I'd hoped it would be. I too was worried that the border looked uneven in the picture, but when I got it, it was fine. I've gotten complements on this rug. It makes an impressive statement on my wood floors. Doesn't slip or slide. I didn't experience any unpleasant smells other than what you would expect a natural fiber to smell like when you unpack it from plastic. After a day, the smell was gone. I had to put a couple of paint cans on the corner for about two days to get it to lay perfectly flat. You will find that it attracts EVERYTHING, so it must be swept a couple times a week. Overall, I was extremely pleased with my purchase. For the price, this rug is very high quality and for a jute feels very nice on the feet. It is not scratchy at all. I also liked that it was delivered with minimal packaging. The corners have yet to lay flat but that is very normal with a lightweight rug like this one. Unfortunately my puppy recently had an accident and it was a bit difficult to get it out. If you put this in an area that may have wet spills, be aware that cleaning isn't so easy. Overall I am very happy with the rug and would recommend it. This was a great buy. Rug arrived in three days and looks identical to those you'd find at high-end home stores. Brown trim is a rich chocolate and the jute/sisal is a soft tan. Comfortable on bare feet and has grip on the back of rug, so no rug pad needed. Zero odor, as stated in previous reviews. Dont hesitate if you are thinking about purchasing. Put this in my den and it looks great. Quality is fine but for price you can't beat it! Don't expect great quality but it does the job and for less than 100, you can't beat it. Ok rug. not great. good for the price. We have this rug in the foyer - - kids, dogs, lots of traffic - great at hiding dirt and still looking nice- HIGHLY recommend! The carpet was the perfect size and looks great! It looks like is will hold up well. I Liked the area rug so much I ordered 2 runners to match it immediately. "Is this rug soft to the touch and comfortable to sit on?" "Does this come in any other colors?" Hello mari2012, this rug is available in various colors. Here are those options: http://www.overstock.com/search?keywords=Hand-woven+Sisal+Jute+Rug+%285%27+x+8%27%29&taxonomy=sub607&sortOption=Relevance&searchtype=Header - Thank you for shopping with us! the color...very hard to find this particular color. I love these rugs as they are perfect for those who have dogs- they do not tend to tear at the edges. Positive reviews and it was recommended for households with dogs. "Is the cotton border on your jute rugs sewn on, or glued on?"